Extreme Cycle Radio is proud to offer the best handlebar mounted, waterproof speakers on the market. Our stereo contains a built in FM reciever, inputs for MP3(USB and SD Card) and an auxiliary jack for Satellite radio! THANK YOU for checking out our web-site. Let me tell you all about “The Motorcycle Radio” Our FM radio tuner with FM, AUX USB and SD card slot functions is VERY loud. Our stylish 3” chrome, waterproof speakers are putting out 120 decibels each. Included with our radio kit are 2 different remotes. 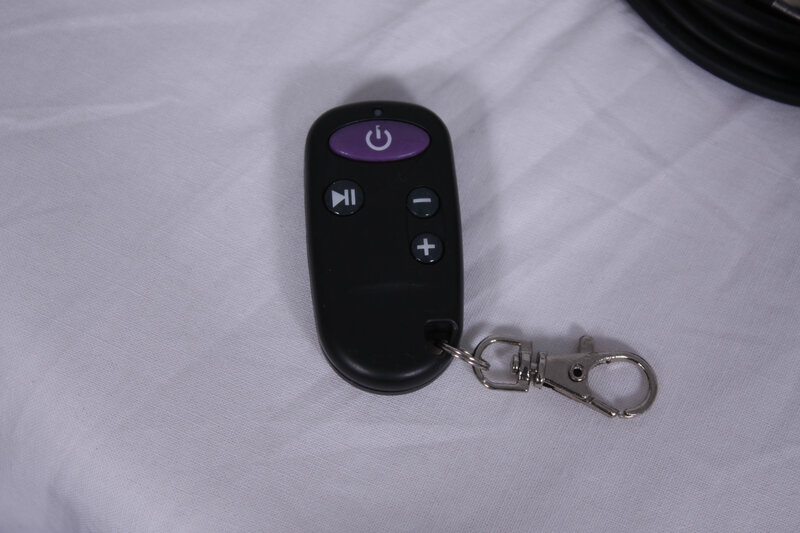 The wire remote can be attached to your handlebars and have your mode selection at your finger tips, the wireless remote can be attached to your bike by Velcro or simply put it in your pocket. Whats really important is each remote can select all functions listed above even when the wire remote is plugged into the radio. Each remote control can control your volume, select your FM channels forward and backwards, allow you to select the mode of entertainment you want or mute the entire system. ‘THE MOTORCYCLE RADIO’ the unit itself, needs to be protected from the weather. If you view our photos, you will see on one photo that I put the radio inside of my windshield leather pouch, on another photo, you only see the 2 speakers mounted on the handlebars because I stored my radio in my rear saddlebag and I use my wireless remote. Also included in the radio kit are 2 sets of 6 foot long wire pigtails that allowed me to connect my handlebar mounted speakers with my radio which is stored in my rear saddlebag. ‘THE MOTORCYCLE RADIO’ is loud, we used the strongest watt amplifier capable of working with the electrical output of your 12 volt bikes system Our radio tuner also incorporates the strongest receiver to reach those far away FM channels. The FM radio tuner has a full range frequency from 87.5 to 108MHz. CHOOSE YOUR OWN MUSIC, want to listen to your private selection of music, no problem, ‘THE MOTORCYCLE RADIO’ has a USB port and a SD card slot or you can plug in your MP3, Ipod or walkman into AUX jack using a common 3.5mm 1/8th inch RCA standard cord. If this isn’t enough, you can also plug your satellite receiver into the AUX jack and now your speakers are blairing a loud 120 decibels of your favorite selections. DO YOU RIDE WEARING A HELMET OR HEADPHONES? Not a problem, ‘THE MOTORCYCLE RADIO” has a headset jack which allows you to listen to your radio by simply plugging into the headset jack, if your helmet is not earphone equipped, any headphone set with the standard 1/8” wire cord can be used under your helmet, no reason to give up your tunes for riding safe. WHAT MODE IS YOUR RADIO ON? With our red LED lites on the radio, a quick glance and you can see what mode function is playing When I set out for a long ride, this is what I do. I insert my SD card which is loaded with my favorite hits into the card slot, I also plug in my satellite receiver using the Aux jack and I now have 3 choices, my SD hits, my satellite and the FM channels my FM radio tuner receives, while driving I never have to stop to load up my functions. I may start out with the FM mode, when I have lost my signal, I can use my remote to scan for more channels or I can hit my SD mode but if I really want to feel young again, I hit my aux mode and my satellite receiver is playing my favorite 60’s hits and is taking me back in time or I can listen to any of the 170 channels my xm/Sirius receiver provides, wow, this radio has every possible option. CAN I INSTALL MY OWN RADIO? Yes, its very easy. Choose the location on your bikes front windshield or forks for your leather bag or use your saddlebag to nest your radio and keep it dry. Route your power cord to your battery or tie it into your bikes accessory switch. I wired mine direct to the battery. After selecting the location on my handlebars for the speakers, I did not like the location of my speakers using exisiting nuts and bolts that are used to secure my brake and clutch levers, each speaker has a bracket attached to it to be used for this purpose so I chose to use P clamps NOTE; P CLAMPS ARE NOT INCLUDED, since motorcycle handlebars range from 5/8th” to 1 ¼” diameter, you will need to source them from a dealer or the internet. I used the 1” P clamp available from Harley Davidson, they cost me $9.95 each and to secure my wire remote, I used a Kuryakyn “Universal Accessory Mount Clamp” part number 1420, it also cost me $9.95. After I had my speakers installed, I realized I could have used the P clamps or the universal mount clamp for all 3 items. Listed within this web-site are part numbers for the P clamps available from Harley Davidson and P clamps and the universal mounting clamps available from Kuryakyn. Determine your handlebars diameter and get them ordered so when your radio arrives, your ready for installation. QUALITY AND DEPENDABILITY was a must. “THE MOTORCYCLE RADIO’ has been under development for the past 5 years. Our engineers have incorporated the latest in sound technology, delivering the strongest, loudest watts to the high watt speakers providing you with 120 decibels of sound from each speaker. “THE MOTORCYLE RADIO” has it all, order yours today and hear what you have been missing. I hope I have provided you with all the information you want to know about our radio, I trust once you have compared feature for feature, you will see why this radio is the radio you have been waiting to hear. During the development of this radio, I purchased several other systems and incorporated the best of their features and then loaded ours up with features they didn’t have. Each of the systems I purchased advertised mounting brackets included, only to find that when the radios arrived, there were no mounting P clamps, needless to say, the surprise was less then impressive and I vowed to explain in detail everything I would want to know if I were buying this radio. As founder of this company, I want to put out a radio that sells itself by word of mouth. If you should stop by our booth at any of the bike rallies, stop and share your radio experience with me. I want this to be the best $289.00 you’ve spent on your bike.